As I was driving in the car this week, I felt a bit of discomfort. Ever since I let someone borrow the car, I've had trouble getting the seat and steering wheel back into the perfect position, but I had thought that I'd finally fixed the problem and acheived a comfortable setup. ...Yet, why did my wrist hurt so much? Surely the steering wheel was pulled out too far, or something. 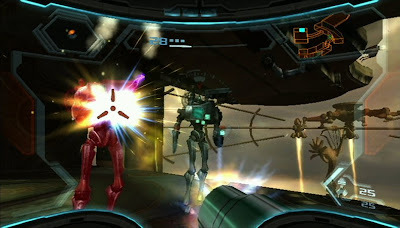 Then it occurred to me: All this week I have been playing Metroid Prime 3 for the Wii, my first "real" Wii game that requires full use of the motion-sensitive controls (Mega Man 9 uses a standard controller style, and 20 minutes of Wii Sports hardly counts). After an hour or two a day of grasping the Wiimote (as we affectionately call the controller), pointing it at the screen to aim, and flicking it to make my character jump while in ball form, my wrist was finally starting to feel the strain. The other night, I was so worn out from a very busy day that I wanted to just slump down into my couch and play video games to unwind. Just as I was finally settled in to play Metroid Prime 3, my Wiimote batteries ran dry. Sighing, I struggled to my feet and spent a few minutes not playing video games to rummage around for some fresh batteries. Then I collapsed once again on the couch and resumed playing. ...And by that point I was so exhausted that I could barely lift the Wiimote to point it at the screen so I could play the game. Last night, I had no desire to sit up normally while playing video games. I tried laying sideways on the couch, but I had trouble aiming the Wiimote at the screen. I tried to sit leaning back, controller in my lap, with my leg propped up horizontally across my knee. This didn't work because my leg blocked the signal from the Wiimote, so I couldn't aim at anything on the lower half of the screen. So... I sat up straight. 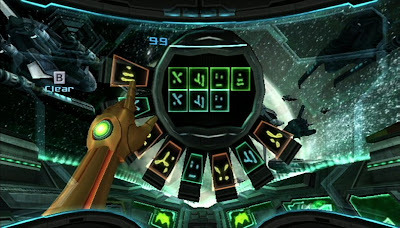 Nonetheless, Metroid Prime 3 is very enjoyable. And I'm surprised by how quickly I adapted to the controls and accepted them. Really, I don't usually mind that I'm waving around a little stick with one hand and holding what feels like a detonator in my other hand instead of gripping a regular controller. For the short term, everything is alright. But I think about the long term. I think about the legions of dead batteries that will clutter our landfills. I think about how the minor wrist discomfort I'm experiencing now might turn into something more serious over time if I keep playing these kinds of games. Maybe it's a good thing that video games allegedly don't require much thinking. This is why I've never been particularly enthused about the Wii. I think it's a neat idea and that there are some games that can really take advantage of it... but on the other hand, I also think that it's like 3D -- a lot of people are just doing it because it's there rather than because it makes for a better game or anything like that. And in fact, sometimes it probably makes for a worse game, just like 3D.